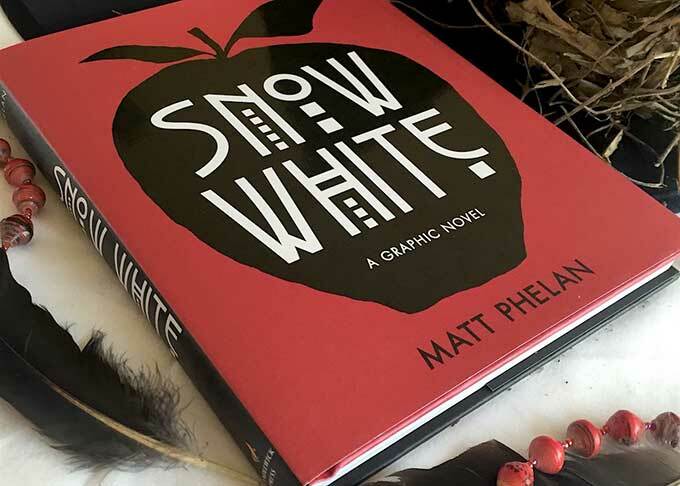 Snow White: A Graphic Novel reads like a silent movie. Matt Phelan’s cinematic re-telling of the classic fairy tale, film noir style, uses watercolor to soften the edges of the film genre’s brash tropes, and blur the lines between grit and glitz in Depression-era Manhattan. I am easily overwhelmed by graphic novels and often feel as though I’ve been caught in a bombardment of text or images or both. Phelan employs text in much the same way he does color — sparsely, and to great effect — so that the movement of the story comes from the art. Color is used like mood lighting. Though the images are reminiscent of the gray scale of black and white movies, the flashbacks to Snow’s childhood after her mother’s death (her father’s subsequent spellbound love affair with the evil Queen, and Snow’s banishment to boarding school) are fittingly sepia-toned. A blue and white winter, perfect like Snow, shines out of the window at Macy’s. The stepmother’s scenes are often washed in greens and burgundies — the colors of witches and blood. And, though not a thatched cottage in the woods, the home of Snow’s seven street urchin devotees is warmed by an earthy brown glow. These subtle washes are balanced with startling red stains—flushed cheeks, blood, the infamous apple, and a smudge of green blush that bluntly confirms the femme fatale’s wickedness, and more deeply, and later literally, draws connections between this classic fairy tale and another beloved, cinematically transformed story — The Wizard of Oz.